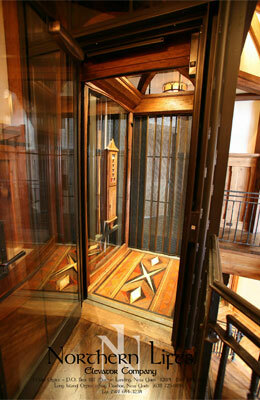 Northern Lifts has over 22 years of experience working in the elevator and lift industry. We strive, as we always have, to build strong relationships and maintain a solid reputation with our customers, from building contractors and architects to business and homeowners. We provide quality equipment backed by dependable service to enhance our customers lives and increase the value of their homes or buildings. We pride ourselves on timely and professional service and are committed to providing quality elevator and lift products, no matter how large or small the task. Northern Lifts has always provided free design assistance and site visits as needed, helping each customer develop his or her conceptual idea into a real life solution to meet their individual needs. For more complex and specialized projects, we also design, build, and install truly unique, one-of-a-kind custom elevators. With these, each piece is individually hand crafted where applicable and assembled in our shop in upstate New York, then disassembled, crated and shipped to the project site where it is carefully and precisely re-assembled and installed, producing a beautiful finished product. In addition to the installation of new elevators and lifts, we provide service, preventative maintenance, repairs and upgrades or modernization of existing lifts, whether or not originally installed by us. Our coverage area extends from downstate NY to the Canadian border, while also providing service in Vermont, western Massachusetts and neighboring areas throughout New England. We operate out of two New York State locations: Bolton Landing in the upstate Adirondack region where our main office is located, and Sag Harbor in the Eastern Long Island and Hamptons region. We are equipped with the most modern trade tools available and a knowledgeable staff of technicians to provide the highest quality installation, repair and service on the many different types of equipment the industry offers. Northern Lifts also offers semi-annual and annual preventative maintenance agreements tailored to individual needs depending on the type of lift and how its used. Additionally, we provide QEI Inspections to help our customers stay code compliant with local, state and national regulations. As always, references are happily provided. 45 Indian Brook Hollow Rd.